Following the previous day's performance in San Francisco, The Beatles flew straight to Las Vegas, where they arrived at 1am. Their chartered aeroplane landed at 1am at the Old McCarran Field at McCarran International Airport, from where they were driven to the Sahara Hotel. Two thousand fans defied the city curfew to see them arrive. The group spent the morning in their 18th floor penthouse suite, before leaving at 2.30pm for a sound check. Before LA we went and played in Las Vegas, where Liberace visited us. I think the first four rows of that concert were filled up by Pat Boone and his daughters. He seemed to have hundreds of daughters. There was all kinds of trouble in the States. There was everyone trying to sue us. There were girls trying to get into our rooms so they could sue us for totally made-up things. There was always this very peculiar suing consciousness. I'd never heard about suing people until we went to America. The Beatles performed two shows at the Las Vegas Convention Center, at 4pm and 9pm, each of which was seen by 8,000 people. Between the two shows the Los Angeles Police Department received a bomb warning, but decided that if they cancelled the second performance the risk of violence by disappointed fans was too great. The set was the standard one throughout the tour: Twist And Shout, You Can't Do That, All My Loving, She Loves You, Things We Said Today, Roll Over Beethoven, Can't Buy Me Love, If I Fell, I Want To Hold Your Hand, Boys, A Hard Day's Night and Long Tall Sally. 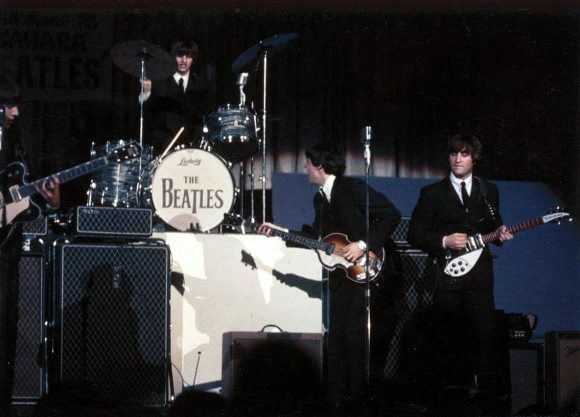 After the second concert The Beatles were advised to stay away from casinos, after police concerns that underage fans would be tempted to follow them. I attended the afternoon performance. My dad was working at the Stardust and got “comp” tickets. I believe they were just a couple of dollars each. The Beatles sang through the PA system and played through their amplifiers. You could not hear the music above the screaming. After all, this was the concert scene in its infancy and things were kind of primitive. My uncle, a Vegas hotel owner (and world class poker player) got my family tickets to the evening show. It was exciting but also a bit of a disappointment. The Beatles played for only about 1/2 hour and like Jim said about the afternoon concert, the little girls (I was about the same age as most of them) screamed so loud it was hard to hear the music. Still, I am happy to have witnessed a part of Beatles history. I was fortunate to attend both shows almost 50 years ago. Four of us went and we were 14 years old at the time. We traveled to Las Vegas with our friend’s older sister who I believe was just 21 so we didn’t have a lot of supervision. My other friend’s father was a reporter with the Arizona Republic in Phoenix, Arizona and he got us comp tickets in the second row for the first show. My uncle lived in Las Vegas and got us tickets for the 2nd show in the balcony. We also stayed at the Sahara hotel and saw the Beatles get into their limo to go somewhere. After reading this article it must have been the sound check. We also saw them waving from the penthouse. Naturally we attempted to get up to their floor in the elevator but got caught and ran. While both shows were great, the first was amazing as we were at the right of the stage in row 2. We were right behind an American actress of our time named Connie Stevens and her husband actor James Stacey. As in other descriptions, their equipment was just a PA system and pretty small amplifiers. We were definitely Beatlemanics and I remember crying and screaming when we saw them. One other recollection is the warm up group. It was the Righteous Brothers duo of Bill Medley and Bobby Hatfield who were popular at the time. To this day I will never know how I talked my parents into going but it was certainly a life experience I will never forget. I still have a box of Beatles memorabilia and know I have a few pictures taken at the show and am going to see if I still have the ticket stubs. I saw the concert on a whim. I lived in mid-MIssouri at the time and my best pal and I decided to take Route 66 out west and we wound up in Las Vegas. Had no knowledge that the Beatle’s would be playing there at the time, but we scored two great tickets on the floor about twenty rows back on the aisle. I was playing in a cover band at the time and we covered many of the Fab Four’s early tunes so the concert was a surreal experience for me. I wish I would’ve had the foresight to save my ticket stub. Been a Beatle’s fan all of my life as all of my children have. G. Cline, Columbia, MO. is the full audio of this concert found anywhere? either the 4pm or 9pm show? I was at the Beatles concert on 20th August 1964. My dad queued for EIGHT hours to buy tickets for me and my cousin Jean. Las Vegas was our last fling before my family moved back to England after 18 months in California. We had the BEST time. I remember screaming myself hoarse – I was only 14 years old! In my opinion, the Beatles changed the face of popular music for ever. They weren’t called ‘The Fab Four’ for nothing! I was at the back entrance with my friend Joyce…we watched the band drive through the big doors. George and Ringo in the first black Rolls Royce…right behind them John and Paul…we were at the back because, WE DIDN’T HAVE TICKETS for the first show…suddenly a fellow walks up and asks Joyce what she was doing there…she tells him we just wanted to get a glimpse of the band. He takes her hand and she takes mine as we single file walk into the back door of the convention center lead by this great guy that happened to be a detective friend of her mother. As we don’t have tickets… we stand at the front of the stage just below John’s Italian made Beatle Boots, of which I had several pair. Very cool boots. Every time John shook head with that Little Richard…Woooo sound his sweat would fall our way…great show. Little Richard began Rock and Roll…The Beatles ended it. I was an 11 year old hick kid from a small town in Utah. I first learned of the Beatles by laying in bed at night listening to KOMA radio out of Oklahoma City, on my brand new pocket transistor radio I got for Christmas. I could only get the station at night. The Beatles were a brand new ‘hot’ sensation and folks were just learning about them. I begged my mom to buy their first albums and I played them to death. When they came on the Ed Sullivan show in the spring of ’64, all my friends in the neighborhood gathered and laid all over the living room floor to watch. That summer, in August, my older sister had just got married and moved to Las Vegas with her new husband. She was 21 years old. She wanted my brother, younger sister and I to come down and hang out with her. It was summer in Las Vegas, we were unchaperoned and we were having a blast. I don’t know how, but she was able to get tickets to see the Beatles when they came to perform at the Convention Center. Front row balcony. Right in the center. Awesome seats. We could see everything. Even the items of clothing showering the stage. There were other acts with them too. I remember The Righteous Brothers, Jackie DeShanon (I think), and The Bill Black Combo. The crowd screamed like banshees the whole time and chanted Beatles, Beatles, Beatles. You couldn’t hear any of the music being played. When the Beatles were finally introduced and came running onto the stage, the place literally exploded. The decibel level was brutal and hurt my ears. The seventeen year old friend of my older sister was clawing at my right arm and almost made it bleed, but I couldn’t care less. That moment changed the course of my life. I learned how to play the guitar and bass right after that and was earning money playing in the local clubs at 16. Right out of high school, I skyrocketed to a place among some great musicians playing a national circuit. Thanks to the Beatles, I am now, in my old age, an accomplished multi-instrument musician, song writer, arranger, studio musician, recording engineer and a broadcast engineer. Funny how inspiration can have so much to do with shaping ones life. Grab hold, and hang on.